If Ben Rowe was working a normal job on Sunday, he probably would have called in sick. order. Larry Gelinas didn’t repeat his top five of one season ago, but that would have been difficult seeing that he didn’t enter the race. Taking his place in the top five was Cassius Clark, who was seventh a year ago. There weren’t many surprises at White Mountain. There was some good hard racing (a little bit too hard sometimes), some gutsy driving and several entertaining storylines for fans. The most compelling of which was Rowe’s iron man victory. Rowe wasn’t even sure that he would be able to endure to the finish. no hard feelings. Cassius Clark and Tracy Gordon tangled and there were. We’ll have full coverage of all of the post race thoughts of the PASS newsmakers later this week on Speed51.com in our PASS leftovers story. Mulkern came alive in the final laps and started passing cars on the outside like they were standing still. He was helped by the fact that the track was oiled down by the fact that there was fluid on the track, especially in the bottom racing line. What worked to Rowe’s favor was that there weren’t very many caution flags during the race. The first 61 laps ran clean and green. At that point, it was a different Rowe who was out front. Ben’s father Mike started on the pole and after battling with Johnny Clark for the first few laps was able to check out on the field until tangling with the lapped car of Ricky Rolfe and falling to the tail end of the lead lap himself. Tracy Gordon inherited the lead at that point, but Ben Rowe was in his tire tracks and got by him soon after the restart. From there, Rowe pretty much had the field covered while Gordon, Johnny Clark, Cassius Clark, Richie Dearborn, Mike Rowe and Scott Mulkern battled hard for the top five positions. 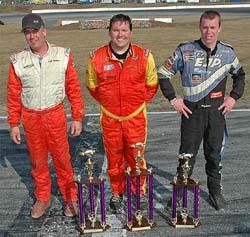 Rowe didn’t crash and he was able to hold off Mulkern, Cassius Clark, Johnny Clark and Mike Rowe at the line. Rowe was very much under the weather with a nasty bug this weekend. But the two-time PASS Pro Stock (Super Late Model) champion is running for another title this year and they don’t give mulligans in racing and award points for races that you don’t run. 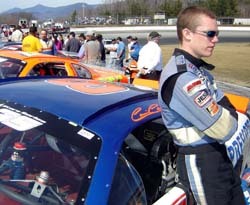 So when the green flag dropped for the Cabin Fever 150 at White Mountain Motorsports Park (NH), he was ready to go. Racing under these conditions couldn’t have been very enjoyable, so you couldn’t blame Rowe for wanting to get the day over with as soon as possible and that’s exactly what he did. He made it to the checkered flag quicker than anybody else and went on the win the PASS season opener for the second season in a row. Mulkern said that the fluid was mostly on the bottom, so went he ran up high (which he had been doing all day), his car got even faster than his competition. Even the leader had a rough time in the closing laps. So Rowe was able to survive 150 laps of racing and take the victory. 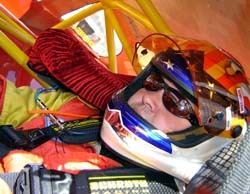 He was exhausted and dehydrated after the race and would need a relief driver to make the three hour trip back to his home in Turner, Maine. 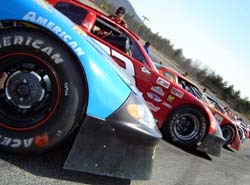 The PASS tour now takes a week off before heading to the Oxford Plains Speedway on April 30th. Speed51.com will have full coverage of that event. But before that, stay tuned this week for a White Mountain photo gallery, as well as a hearty serving of PASS Leftovers.